have brought out the entrepreneurial side of many Vietnamese. We first arrived in Vietnam in 1998, after a month spent working in Cambodia. Although the Vietnam War had ended more than twenty years by then, we were still very curious about how the country was recovering from its effects. At that time Vietnam’s socialist government had begun to institute economic reforms and was renewing diplomatic relations with other countries such as the U.S. As a result the Vietnamese were beginning to rediscover the wheeling and dealing world of capitalism, something that would probably make Uncle Ho turn in his grave. Motorcycles were the main mode of transportation in Vietnamese cities when we first arrived. Nina rides at the back of one of them in Da Nang. More and more cars are taking to the roads as Vietnam’s economy continues to grow at a phenomenal rate but motorcycles still proliferate. One of the first things that we immediately noticed was the proliferation of hundreds of thousands of motorcycles on the city streets. We very quickly learned that in large cities such as Ho Chi Minh (HCM) and Hanoi our usual practice back home of waiting for traffic to clear before crossing a street does not work because the streets are never clear of traffic. Instead we were advised to go ahead and cross the street regardless of the traffic and to let the motorcycles avoid us. This was nerve-wracking at first as dozens of motorcycles buzzed past, some of them zigzagging to avoid us. But we learned that if we maintained our pace and did not do any abrupt stops or sudden changes of direction we were bound to cross the street in one piece. (It doesn’t always work that way, unfortunately. Some of our Vietnamese friends have been hit and injured by motorcycles.) Leo remembers a funny moment when two very frightened Singaporean girls – obviously new to the country – used him as a shield when he was crossing a street in HCM. (Well maybe it’s not that funny.) It’s a tactic you will read from some travel guides seeking to help neophytes get accustomed to Vietnam traffic. 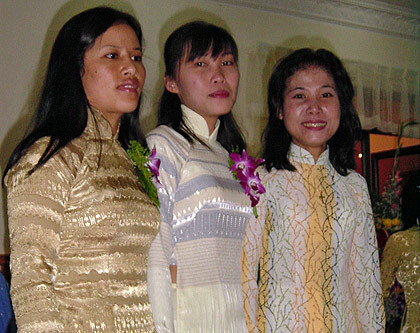 Vietnamese women in their native Áo dài at a special occasion. Many schoolchildren dress in Áo dài as their school uniform. The millions of motorcycles (no exaggeration here), the noise of street hawkers, and the throngs of people in Vietnam’s crowded cities may turn off some tourists but it always held a fascination for us. After all we had both grown up in Manila’s crowded neighborhoods ourselves. And you can always go to the countryside to explore Vietnam’s beaches, its lush green fields, sleepy villages, huge caves that are only now being discovered and its many historical sites. Or sail through captivating Ha Long Bay with its numerous limestone karsts, visit the hill tribes of the north and central highlands and tour the ancient imperial capital of Hué. 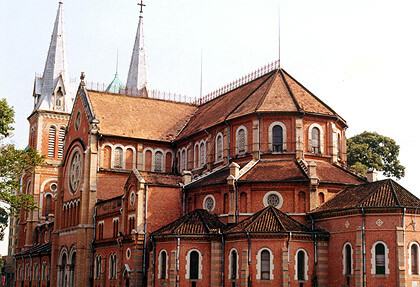 Vestiges of French colonial rule: the Notre Dame Cathedral in Ho Chi Minh City. As most of our time in Vietnam was spent in major cities such as Ho Chi Minh, Hanoi and Da Nang we’ll focus on life and scenes in these cities but any traveler has a burgeoning number of options to choose from as the world continues to discover the charms of this country. A seafood pho with a bowl of grilled chicken and fried spring rolls. 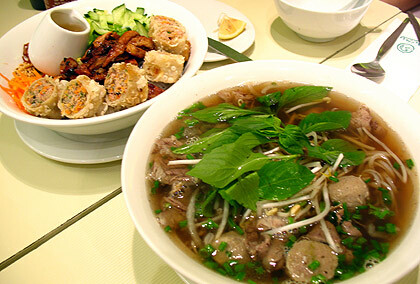 Without a doubt one of Vietnam’s famous attractions is its cuisine. The Vietnamese pho or broth soup served with beef or chicken and rice noodles plus a healthy serving of vegetables, bean sprouts, mint leaves and lime is the most famous. 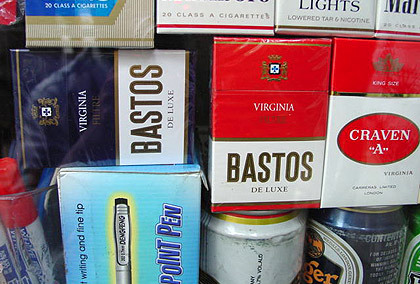 It is readily available in street stalls or cafes. (Vietnamese street eateries serve cheap and often tastier food than those available in restaurants and are relatively safe to eat.) Goi cuon or fresh spring rolls and bánh mì or French baguettes stuffed with grilled meat, herbs, pickles and chili are another of our favorites. We’ve also been to several Vietnamese cafes or restaurants that serve their own version of shabu-shabu or hotpot dish where steamed or grilled meat and vegetables are assembled by the diner into rolls using dried rice paper sheets. The rolls are then dipped into a variety of sauces often including fish sauce. The preparation involves a bit of work. When eaten with others, however, it becomes fun, even comical as people inexperienced in the art of assembling rolls end up producing awkward-looking sizes and shapes. The Vietnamese usually take this meal only for special occasions because of the amount of time and work needed. among men in the world–seven men in 10 smoke. That figure is down to 56%. 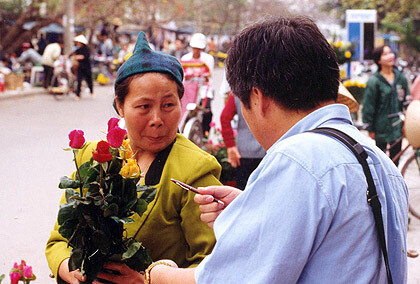 We visited Vietnam several times in the late ‘90s to early 2000’s as part of our work. What we saw back then was a precursor to what is happening in the country now, namely the booming of the tourism industry and an economic growth that is among the highest in the world. For sure Vietnam looks quite different now than when we first visited in 1998, but we’re also sure that it still retains its old charm.